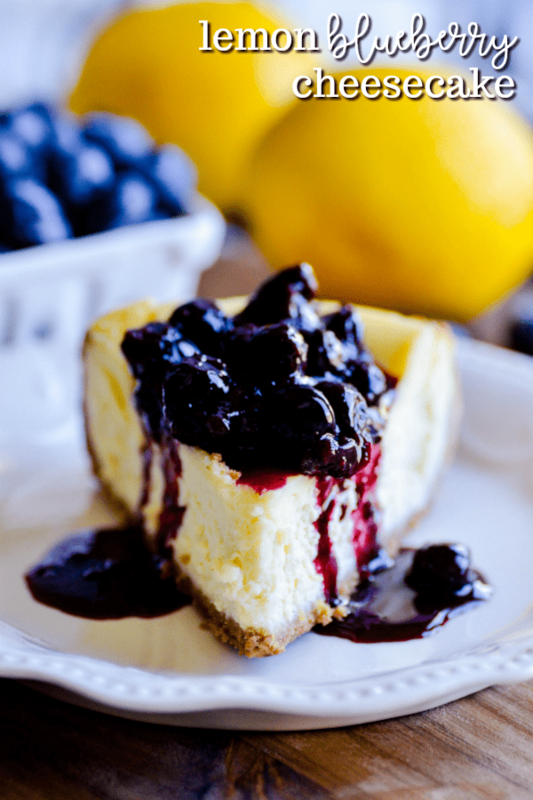 Smooth and creamy lemon cheesecake topped with a lemon blueberry sauce. 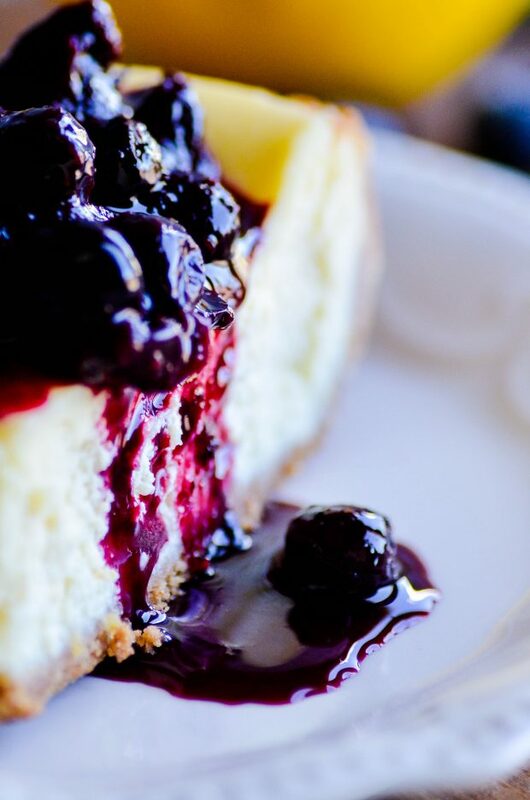 In other words, this is the ultimate spring and summertime cheesecake! Check out my other Lemon Recipes! It’s important to leave the cheesecake in the oven after baking. Otherwise it will cool too quickly and crack. I love blueberries with lemon! However, don’t feel limited to just using blueberries. You could use raspberries and blackberries too! Using room temperature ingredients will also help prevent cracking. Additionally, it will significantly contribute to the creaminess of the cake. 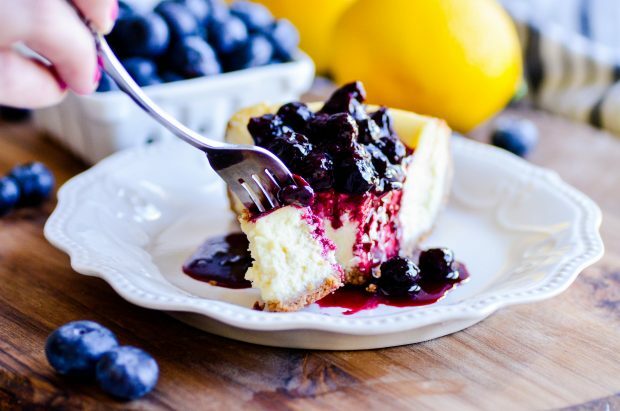 Smooth and creamy lemon cheesecake topped with a lemon blueberry sauce. 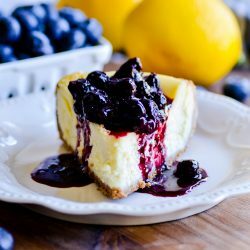 The ultimate spring and summertime cheesecake! In a mixing bowl, combine the ingredients with a fork until evenly moistened. Lightly coat the bottom and sides of an 8-inch springform pan with non-stick cooking spray. Pour the crumbs into the pan and, using the bottom of a measuring cup, press the crumbs down into the base and up the sides. Freeze for 5 minutes. Using an electric mixer, beat the cream cheese on low speed for 1 minute until smooth and free of any lumps. Add the eggs, 1 at a time, and continue to beat slowly until combined. Gradually add sugar and beat until creamy, for 1 to 2 minutes. Add sour cream, lemon zest, and vanilla. Scrape down the sides of the bowl as needed. The batter should be well-mixed but not over-beaten. Pour the filling into the crust-lined pan and smooth the top with a spatula. Bake for 45 minutes. Turn off the oven and let cool in the oven for 30 minutes. Transfer to the refrigerator, loosely covered, for at least 4 hours. In a small saucepan add all the ingredients and simmer over medium heat for 5 minutes or so until the fruit begins to break down slightly. Let cool for a few minutes before spooning over the cheesecake. Check out my favorite lemon recipes! These sweet rolls were insanely delicious. The bread is tender and buttery and just melts in your mouth. 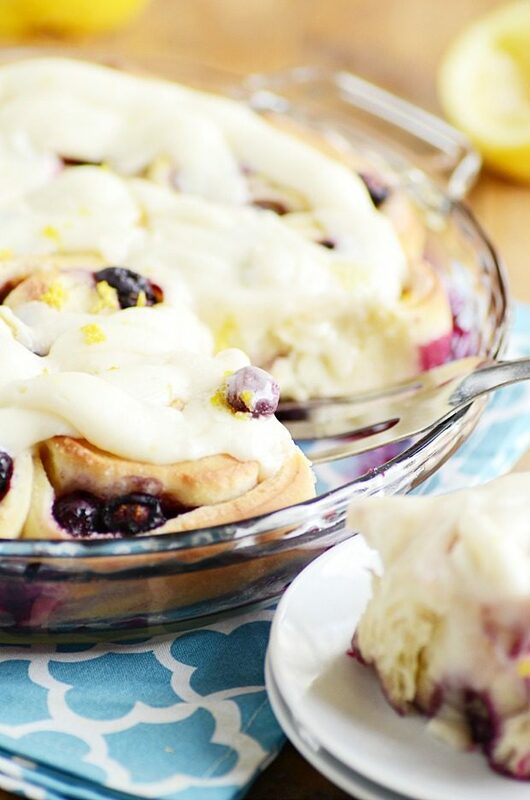 And the lemon and blueberry flavors really come through perfectly, making this a gorgeous and delicious spring time breakfast or treat. 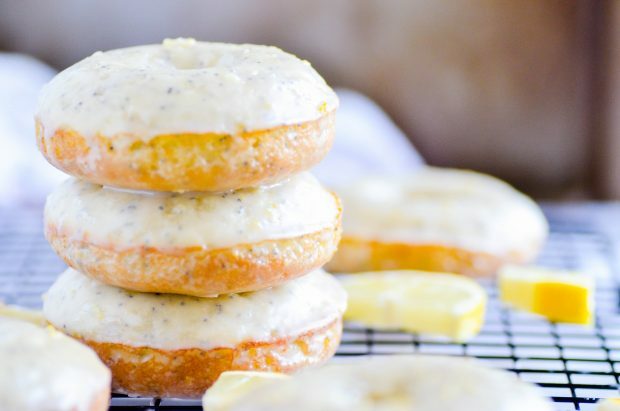 The lemony frosting takes this whole thing over the top, and you will be licking the pan once they’re gone! Rich lemon cake that tastes incredible with my favorite cream cheese frosting and raspberries! 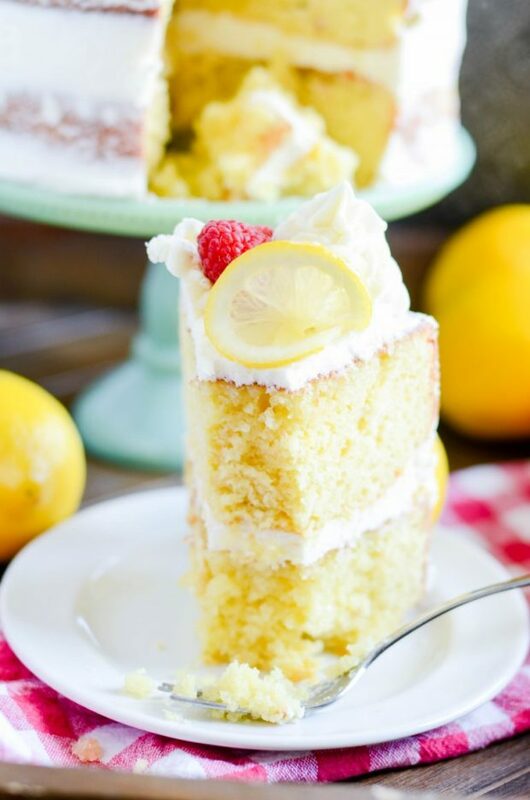 A sweet lemon syrup drenches both layers of cake, and it is BY A MILE, the best part of this cake. So after the cake and after the lemon syrup goodness, comes the cream cheese frosting. It’s fairly basic, just your standard cream cheese, butter, and powdered sugar frosting. But we’re also adding a splash of REAL lemon juice, and that’s the clencher. It brings all the elements of the cake together and perfectly balances the tart from all of the lemon.